Here's a very quick recipe post (sort of The Reduced Mrs K), mainly to see how short I could get the video and still make some sort of sense. 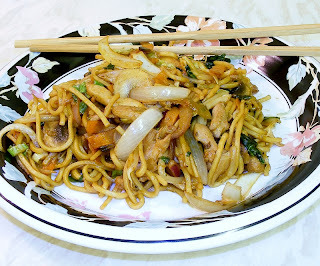 Mie Goreng is cooked in a similar way to Nasi Goreng, but in this case Mrs K uses chicken pieces rather than lamb. Gado-gado is one of the only vegetarian dishes Mrs K makes. It’s a delicious mixed vegetable salad with peanut sauce (almost identical to satay sauce). The beauty of it is that the ingredients are not set in stone - you can use a wide variety of green and salad vegetables. One important (but again, not essential) ingredient is ketupat (rice cakes), which we’ve covered in another post. 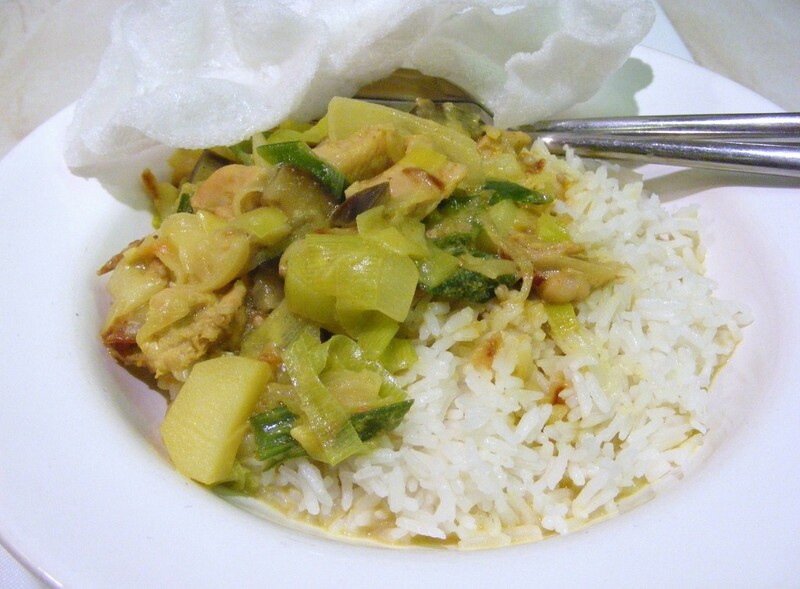 Ketupat is a rice dish that's served on special occasions, most commonly on the Lebaran (Idul Fitri) holiday at the end of Ramadan, but also on birthdays and weddings. Mrs K likes to cook it at any time. Bubur ayam is a great Indonesian comfort food. 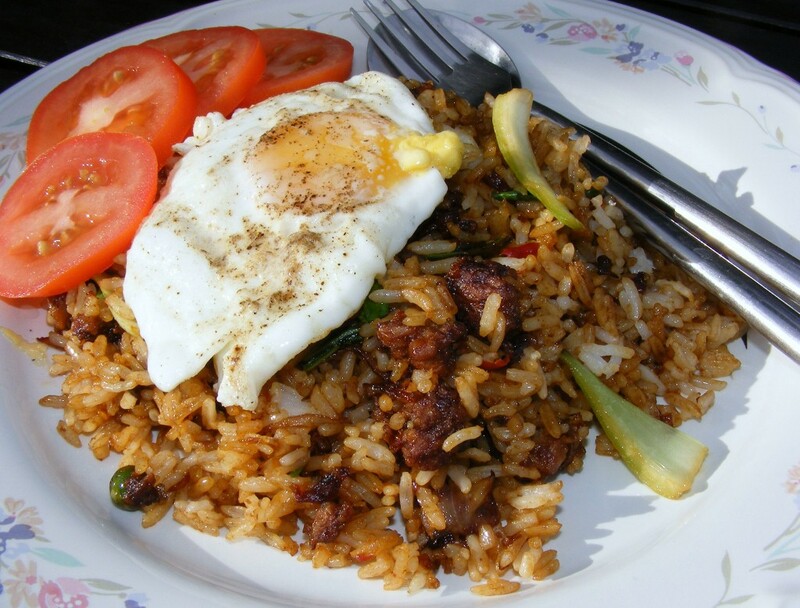 It's also traditionally a breakfast dish, but we eat it at any time. Mrs K, as ever, has her own way of doing things - there are millions of variations. There is one new ingredient (pickled mustard greens), but it's only an optional garnish, so don't worry if you can't find it. Mrs K has been going to the enormous Wembley Sunday Market for the last couple of weeks, mainly because one of the stalls is run by an acquaintance of our daughter. She hails from Wolverhampton and used to run an online Indonesian store tied to her real store, but that seems to have disappeared. 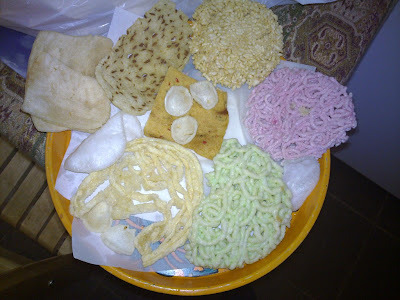 But most Sundays she sets up stall flogging hard-to-find Indonesian treats, such as the krupuk pictured below. 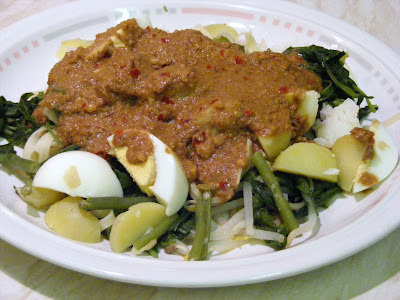 Sambal ulek is one of Mrs K's star dishes. It's a smooth chilli sauce that's actually one of her simplest recipes (it doesn't even need a video!). 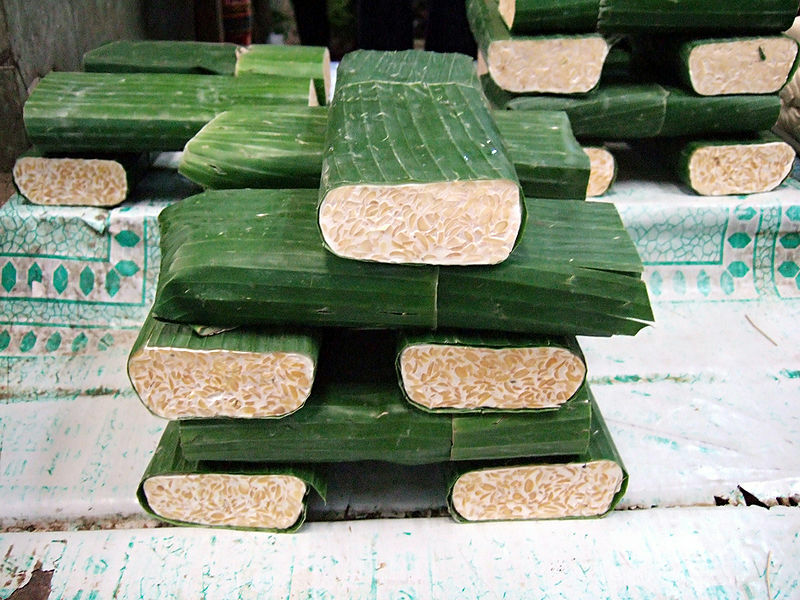 'Ulek' is the Indonesian name for a stone pestle (you will often see it spelled the Dutch way 'oelek'). Mrs K doesn't use an ulek as it takes forever - a hand blender is a perfect substitute and gives a much smoother result. 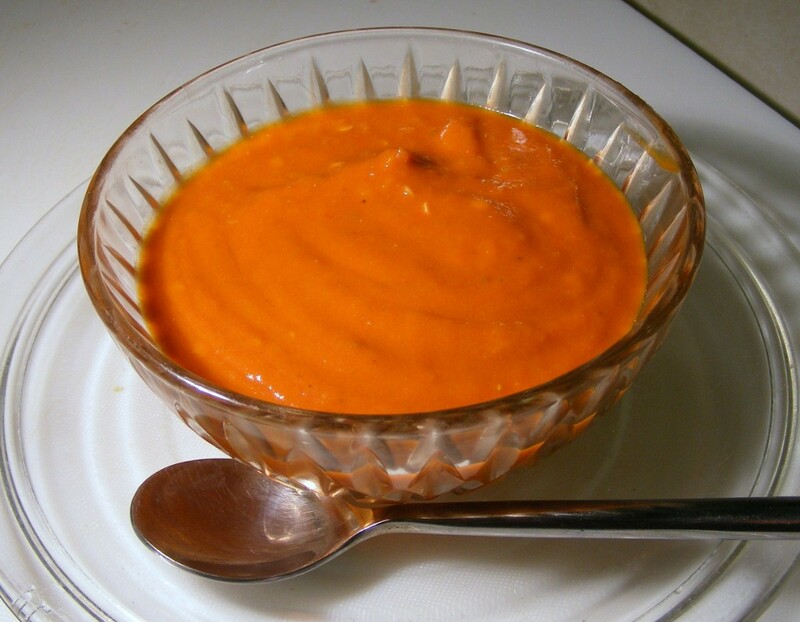 You could use a food processor, but it would probably get stained unless it has a glass bowl. This sambal can be used for anything - it's almost Mrs K's equivalent of tomato ketchup; perfect as a dip or pouring sauce, in cooking or even in your sandwiches. It can be as fiery or as mild as you wish - just pick the strength of red chillies you're comfortable with. In this batch we made, Mrs K used a mixture including birds' eye chillies and Scotch Bonnets. Needless to say it was extremely potent. The quantities used here make 5 small (300g) bottles, and cooking time is under an hour. We were alerted to this excellent article in the New York Times about why chillies are so addictive. Seems that scientists seem to think there's an element of masochism involved. Mrs K has her own pet theory, and it's a lot simpler: she says chillies are great 'because they taste good'. And you can't argue with that. We found this lurking on the shelf in Tesco and were intrigued. 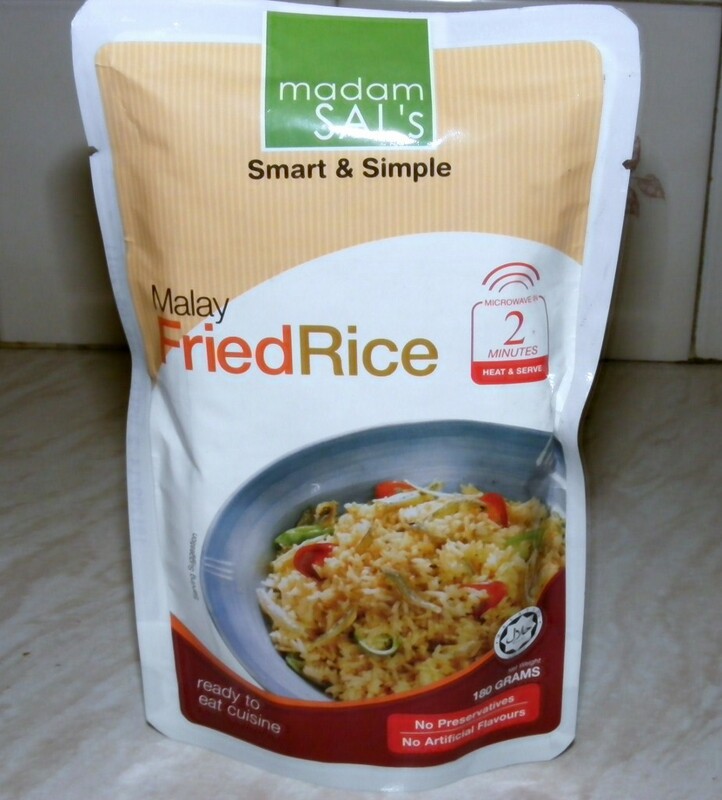 We've no idea who Madam Sal is, but the picture looked semi-appetising so we thought we'd give it a try. 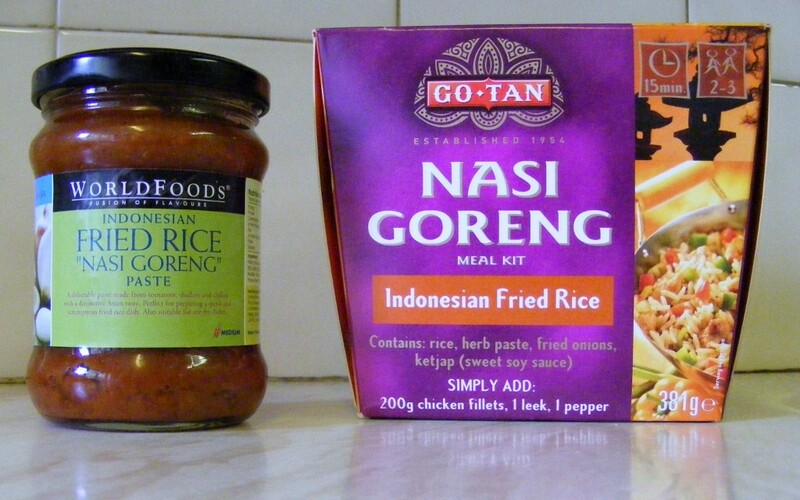 We heard that one of our readers, who shall remain nameless, was so inspired by Mrs K's nasi goreng recipe that they went out looking for an instant version in the shops. Sad, but true. But it did give us an idea - Taste Tests. These are where we take some off-the-shelf products and use Mrs K's culinary wizardry and Mr K's stomach to see what they taste like. Instant noodles are great. They're cheap, quick to cook and amazingly versatile, as we hope to prove with this recipe. It's hardly an Indonesian dish at all, but Indonesians eat vast quantities of the stuff (as does Mr K) so it definitely deserves a place here. There must be at least a gazillion types of curry (kari) in the world, so another one won't go amiss. This one is very mild and 'wet' - there's no thickening used. Without the chilli, our young grandkids love it. We introduce a yummy new ingredient too - coconut milk. 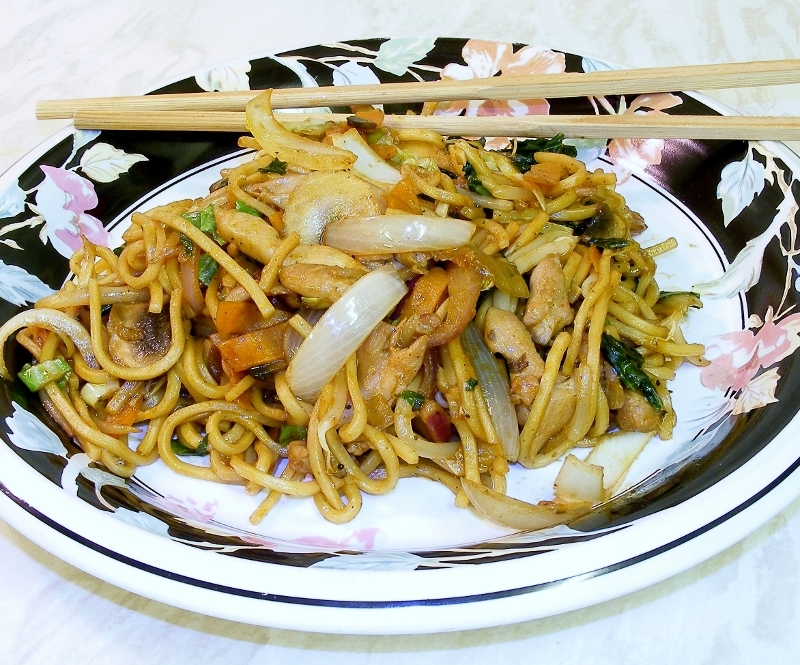 Cooking time is about 30-40 minutes and the quantities below will easily feed four people. Or Mr K when he's dieting. Note that you can use any kind of fresh or frozen chicken - we used four frozen chicken thighs, defrosting them and taking the meat off the bone (taste tip: Mrs K then boiled up the thigh bones for about 20 minutes, strained off the water and used it to boil the rice in). If you're used to the tasteless prawn crackers usually served with takeway meals, be prepared for a shock. The Indonesians are masters at creating weird and wonderful variations on the theme, not all of them strictly prawn crackers, but crackers nonetheless, and they're all cooked in the same way - deep frying. 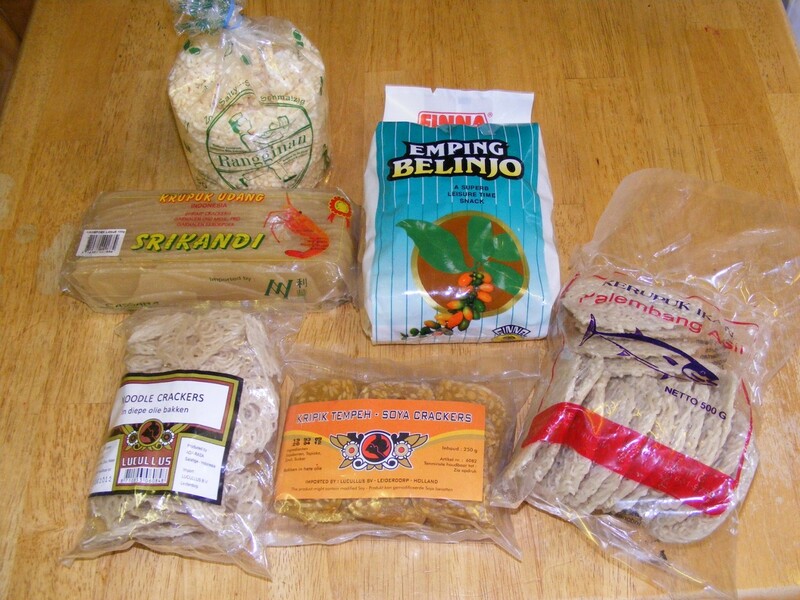 They are universally eaten as an accompaniment to almost any meal, or simply as a crunchy snack. Nasi goreng (nasi = rice, goreng = fried) is another one of those dishes with almost infinite variations - every Indonesian cook has their own way of doing things, and Mrs K is no exception. It can be anything from a quick plain dish with a dollop of chilli sauce to hoover up leftover rice, or a star attraction on its own, with fried chicken or sate accompaniments. Here's a typical quick recipe that Mrs K uses when she doesn't have too much time to faff about. It should only take about 10 minutes once you've prepared the ingredients. Although this uses lamb (kambing is actually Indonesian for goat but that's pretty rare in Western supermarkets! 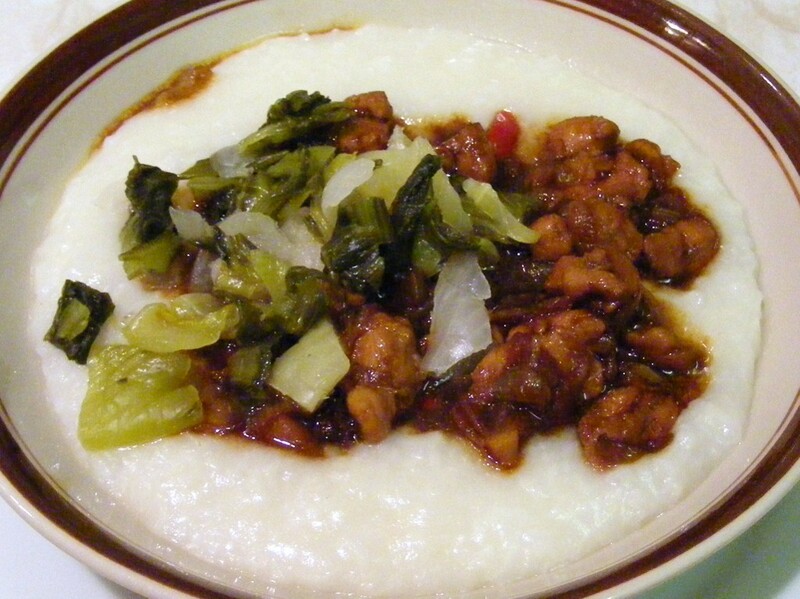 ), if you hate that you can use minced beef or chicken. An aside: Get free updates via email! We know you're all busy, we certainly are (well, Mrs K at least), and we don't have a Facebook or Twitter account (Mr K does, but he's a lazy old codger). And although RSS is our favourite way of subscribing to our favourite sites, most of the world seems to disagree. So we've added the ability to get email updates every time there's a new post added. Click on the link below if this is of interest. Feedburner (which is owned by Google) will then send you a confirmation email, follow the instructions and you're done. You'll only be sent an email when there's a new post, and you can unsubscribe at any time by clicking the link in the emails. Tempeh is wonderful, but elusive stuff. We used to buy it frozen from the Holland & Barrett health food stores, but they've stopped stocking it. It seems like the only commercial UK supplier is Impulse Foods, and there are a few sites selling their frozen tempeh, such as Goodness Direct. But what is it? 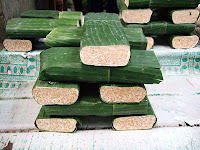 It is actually very simple, consisting of fermented, cooked soybeans (the Tempeh.info site has everything you need to know) formed into a firm cake that can be sliced and fried, or mixed with other dishes. It's popular with vegetarians as an alternative to bacon or even hamburgers. We love it, but sadly haven't bought any for ages, so we were looking round the web thinking of ordering some (you can it get in London's Chinatown or Wembley Sunday Market fairly easily, but we haven't been to town for a while). Our friendly local Chinese store doesn't have any, but they're looking into it. Then Mr K suggested trying to make it ourselves - by all accounts it's a simple process, and you can get a free sample of the starter culture from Tempeh.info. The main barrier is the incubator, as the tempeh needs to be kept at around 30°C for a couple of days. One blog suggested you can use an oven with just the light on, so we're experimenting at the moment to see how warm that gets. Mrs K isn't totally convinced, but she's happy to give it a go. Of course, then comes the problem of finding de-hulled soybeans - apparently de-hulling them yourself is a bit tedious. 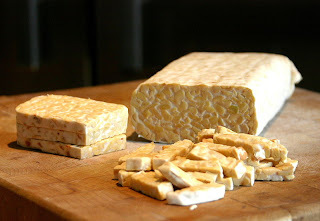 If we go ahead, we'll let you know how we get on, but we're determined to get some tempeh soon one way or another because it's so delicious and very versatile for cooking. 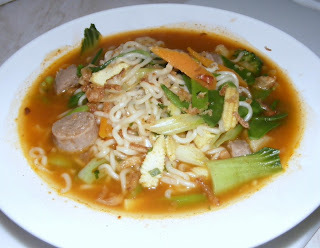 Soto Ayam (soto = broth, ayam = chicken) is one of Mrs K's all-time favourites. It's quick, simple and perfect for a light meal. These quantities will easily feed four people. Or three hungry ones. 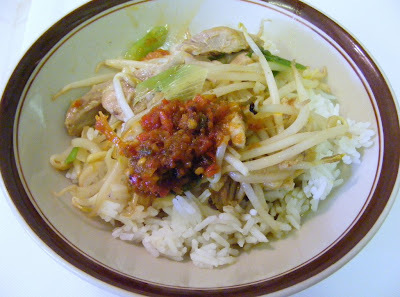 Cooking rice (nasi) is one of those things that drives most people nuts. A lot of this is self-inflicted; us British are certainly obsessed with having the rice grains separate, something I'm sure was promoted by Vesta back in the 70s to justify their chewy 'instant' curries. To most Indonesians, this is half-cooked rice - as their favourite way of eating is with hands only, they prefer a stickier consistency that can easily be grabbed off a plate. Anyway, Mrs K has her own tips and tricks, as usual. Everyone who has tried Mrs K's chilli sauces has fallen in love with them. Here's how she makes one variety, a quick and simple sauce that she calls sambal goreng tomat (sambal = chilli sauce, goreng = fried, tomat = take a wild guess). There are endless varieties of sambal - we hope to cover some of these in future posts. 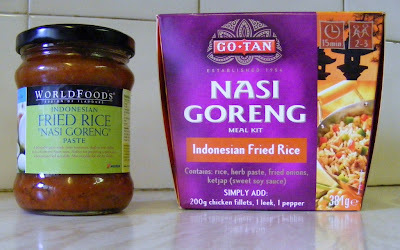 There are also endless conflicting descriptions on the web about what sambal goreng actually is - but we don't care; this is Mrs K's blog, and what she says goes. So there. All the ingredients should be readily available in any supermarket, but remember that none of the quantities are critical - experiment as you feel fit. These quantities will produce about 3-4 jam jars of sauce, and the cooking time's about 45 minutes. One added bonus of the dish is that it gives you a supply of delicious chilli-flavoured oil that you can use for cooking. Mrs K is the talented Javanese wife of Mr K, who is nowhere near as talented. Simple and tasty are Mrs K's watchwords, and you won't need any special equipment or techniques. If you can use a knife, a frying pan and a saucepan you should be fine. A small blender is about the only electrical item she regularly uses. Give the recipes a try, and don't be afraid to experiment. And don't be surprised if you find the names (or ingredients) don't match dishes you've tried before - home cooking is like that! Over the years she has become expert at substituting for hard-to-find Indonesian ingredients, so most of her recipes use stuff you can buy easily. If something exotic is required, we'll let you know where we got it from. Any questions? Put them in the comments and we'll do our best to answer them. Please contact us via the comments if you want to use any of this content. Awesome Inc. theme. Theme images by johnwoodcock. Powered by Blogger. Kelvyn Taylor is a participant in the Amazon Europe S.à r.l. Associates Programme, an affiliate advertising programme designed to provide a means for sites to earn advertising fees by advertising and linking to Amazon.co.uk / Javari.co.uk / Amazon.de / Amazon.fr / Javari.fr / Amazon.it.